After a career in journalism I returned to study as a mature student and graduated in 1995 from the University of Central Lancashire with a BA honours degree which combined ceramics with art history. I now work from a converted out-building at my home in Adlington, Lancashire, and combine my love of making artwork with tuition and workshops in the hope that I can inspire others to release their creative potential. My pots are all hand-built using traditional making methods of coiling and slab-building with the emphasis on form and surface in a contemporary style. Most of my inspiration comes from the natural world. I use plants, seed pods, gourds, shells, pebbles, nuts, seaweed and fruit as a constant source of inspiration. I use a heavily grogged clay which is ideal for hand-building and rely on coloured slips and washes to achieve the surface impact. The colour is often subtle and understated which suggests an evolving process which is part of the piece rather than an addition to it. Some work is burnished and then smoke-fired. Recent experiments involve the use of porcelain, glass, wire and volcanic glazes. A collection of maquettes has resulted in a coral-like installation from which I intend to work on a larger scale. I am involved with several organisations including Northern Potters and Lancashire Art and Craft Guild. I have exhibited regularly at the British Craft Trade Fair and Potfest and I sell my work through organised events and private galleries. My work has been featured in exhibitions throughout the country and has been used by interior designers in the UK and Paris. 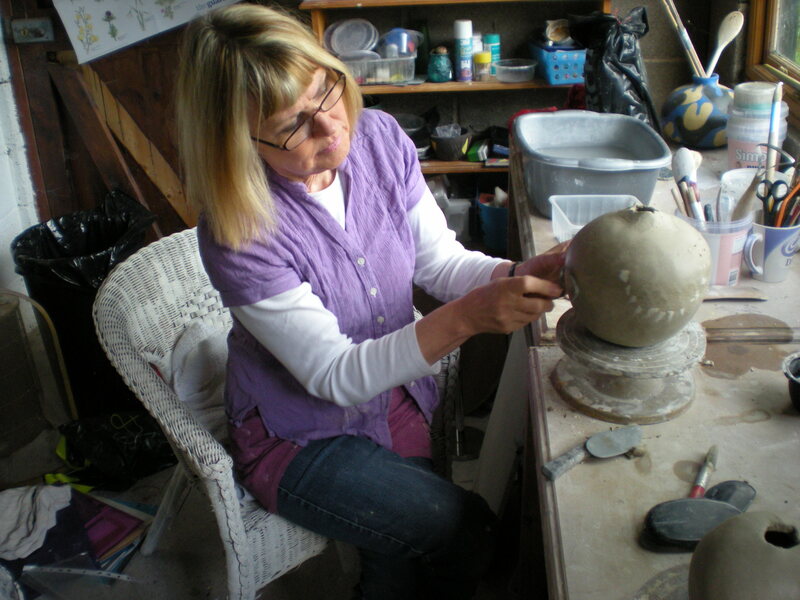 I have recently completed a Masters degree in ceramics at the University of Central Lancashire. The MA ended with an exhibition at the university’s PR1 Gallery. Some of my work went from there to the Harris Museum and Art Gallery in Preston, selected as part of their exhibition of contemporary ceramics. I joined a group of ceramicists from both the Masters and the BA course to exhibit our work at the International ceramics event, Earth and Fire held each year at Rufford in Nottingham.